Apex Kar in Deeside is a cleverly designed kart track where somebody obviously thought... how about a tunnel, or a banked hairpin or should it be outdoors or indoors? And then decided to have them all! So, a real test for novice and experienced drivers alike. 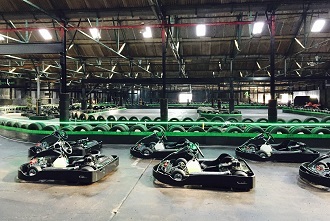 Excellent facilities, good viewing area and robust Biz karts complete the package and well as the usual sprint, endurance or arrive-and-drive formats to choose from. Ideal corporate venue. At the end of the M56, join the A550 following the signs for Queensferry, Take Queensferry and turn off at Sandycroft (B5129). Carry on along B5129 for 1.5 miles. Turn left after Bridge Inn Pub, following brown directional signs for Karting. Take the A55, then Join the A494 following signs for Queensferry, Take Queensferry and turn off at Sandycroft (B5129). Carry on along B5129 for 1.5 miles. Turn left after Bridge Inn Pub, following brown directional signs for Karting. Take the A55 from Wrexham, carry on to the end to join the A494. Take Queensferry and turn off at Sandycroft (B5129). Carry on along B5129 for 1.5 miles. Turn left at Bridge Inn and follow Brown Directional signs. 30-minute junior party session for 8 - 13 year-olds with food provided after the event. For groups of up to 12 drivers: 10 minute practice/qualifying session followed by a 25-lap sprint final. Trophies for 1st, 2nd and 3rd with Champagne for the winner. For groups of 8 - 20 drivers: 10 minute practice/qualifying session followed by a 30-lap sprint final. Trophies for 1st, 2nd and 3rd with Champagne for the winner. An exclusive team endurance event. 15-minutes qualifying to determine your grid position then a non-stop 90-minute relay event for teams of 3 drivers sharing a kart. Select from the list of GP events on offer, or contact us with the details of your group and we will supply you with a list of options and prices.